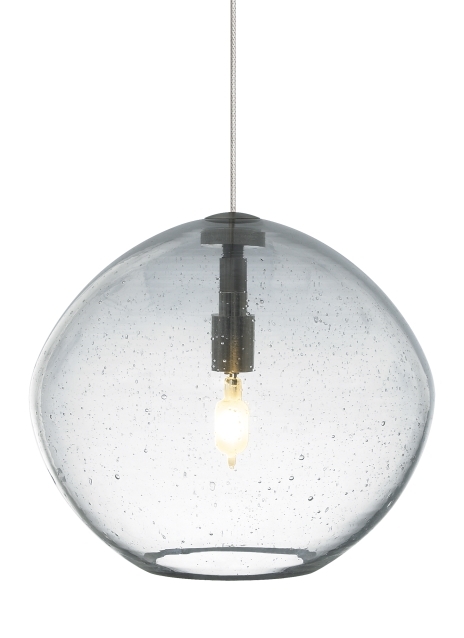 The Mini-Isla Pendant from Tech Lighting features a perfectly irregular organic hand blown round-shaped glass. Skilled artisans work to perfect the seeded technique that leaves hundreds of bubbles suspended within the glass. Adding a touch of charm and warmth to this contemporary glass pendant is the visible incandescent lamping. The Mini-Isla Pendant is available in five contemporary colors, each color further enhancing the unique features most noted to the Isla pendant. Scaling at 72” in length and 6.1” in width the Mini-Isla Pendant is modestly sized making it ideal for home bedroom lighting, closet lighting and kitchen island task lighting. Also available in the Isla collection is the complementary Isla Pendant, simply search for Mini-Isla to find its closest relatives.